Kazi first came to WAG in August 2016 seeking rehab to address weakness and crossing in the hind limb, which had started in June. Prior to June, Kazi was able to walk 1.5-2.0 miles. She is a city dog and does have to do several steps up to the house. Upon her initial visit she’s only able to make it 4 blocks. She is currently taking Deramaxx in the mornings and Gabapentin BID. Two weeks into these medications she started to show more play activity. Sinks in hind legs when standing, has difficulty sitting and transitioning to a stand, sensitivity to cranial L-S spine (when placing acupuncture needles), proprioception delayed in bilateral pelvic limbs, crosses over with both hind legs esp. when turning but occasionally when walking straight. Hyperextension in hocks bilaterally, circumducts both hind legs when walking instead of flexing stifles, no overt lameness, hind feet kept close to midline, no cranial drawer palpated, no resistance or guarding of hind end. Was guarded on ROM of left shoulder and musculature of front limbs generally tight. We decided to start with acupuncture to address the neurological deficits and to help manage discomfort and improve mobility. Her owners did see slight improvement in her gait and stamina in the appointments to follow through the end of August. In September 2016 we opted to add in hydrotherapy and LASER. After 1 session, Kazi decided she wanted to do the stairs again. Therapeutic land exercises were subsequently added to her treatment plan and we began seeing her twice weekly for hydrotherapy. In October 2016, Kazi’s LHL started to show signs of regression – she was having difficulty placing the foot plantar and began falling when posturing. Due to scheduling conflicts, she had now gone 4 weeks in between acupuncture treatments. She also seemed to be negatively affected by cold damp weather. At this point we suggested a Help Em Up Harness. (The owners were reluctant initially but did decide it would be helpful during her next appointment and purchased one from us.) We increased her Gabapentin to 100mg TID. Suggested switching to a BID NSAID -Rimadyl. Her CPs are now absent in the pelvic limbs. She is still continent and still showing L-S tenderness. By November, Kazi’s owners felt her left stifle was bothering her as indicated by not wanting to flex it when walking. She now needs protective paw booties for the hind feet. A medial buttress was noted on the left stifle, possibly chronic micro-tearing of the CCL. We continued a combo of acupuncture and hydrotherapy weekly throughout the month. In the first week of December 2016, we decided to test Kazi for Degenerative Myelopathy using DNC Veterinary’s Buccal Swab test kit. The results were positive. By the end of the month, after a week’s ‘washout’ she was switched to Rimadyl to better manage arthritis, weekly Vitamin B 12 injections SQ and adhered to WAG’s DM treatment plan focusing more on biweekly hydrotherapy sessions, frequent shorter walks and exercises at home. In January 2017, Tramadol was added for pain control, 50mg up to Q 8 hours. By March 2017, function of the LHL had slowly declined and now the RHL was showing deficits and deterioration. Owners report Kazi still gets a “boost” from hydrotherapy lasting 1-2 days. She also feels the LASER has been very helpful and is considering purchasing a unit for their home. They do in fact wind up buying a used class 3B cold fusion LLL unit for Kazi. Hydrotherapy, LASER and at-home regiment continue. In April 2017, I decided to suggest a cart and owners were unexpectedly enthusiastic to try! I was not sure how it would be received – Kazi, since we started working with her, has always been a very stoic, quietly trembling nervous girl. Quite aloof at home and seemingly happy to observe life from her beloved bay window. 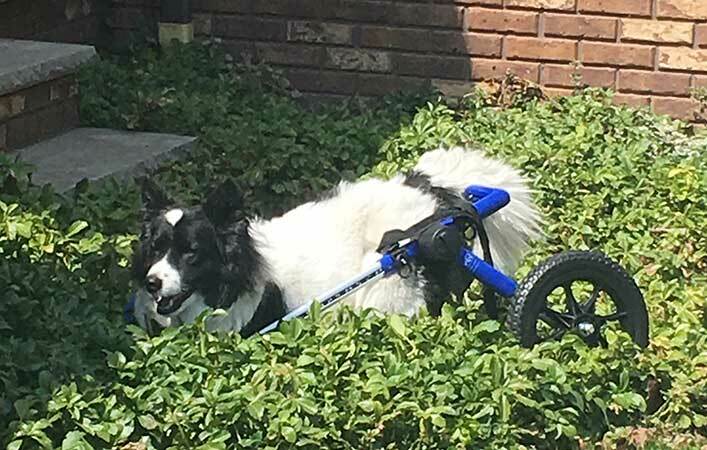 She was fitted with a Walkin’ Wheels rear wheelchair to try as a loaner and the instantaneous joy and acclimation was quite unbelievable. It was like a light switch was turned on and she bolted across our facility! A week later, owners purchased a new one for her very own. By then end of April, Kazi was unable to move her hind legs through the water on the underwater treadmill. Since she loved the cart and was able to spend a decent amount of time in it at home, we decided to halt therapy here and have owners focus more on her at-home therapies. 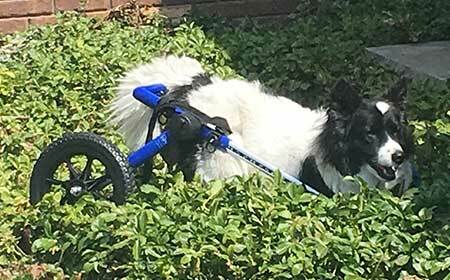 She would still have motor in both hind legs in the cart but not on land for walking or in the water. Demonstrated to owners how to give SQ injections so they could continue those weekly. She checks in monthly with reports and is doing well enjoying her freedom again! Watch out squirrels!